Proposal 2: setting up a site for the hosting and sharing of Scientific Data. Guan Sin said that ComCen could give us significant resources to implement this, as data sets from Science regularly reach into the terabytes (at minimum). He also suggested something more student-focused, but related: a file sharing site for NUS Students, sitting on the NUS network (sort-of like a ‘Rapidshare’@NUS). Of course, we immediately asked about managing copyright issues. Guan Sin said that would be an interesting problem for us to solve, and that we would need to figure out how to solve it before making the service available to students. 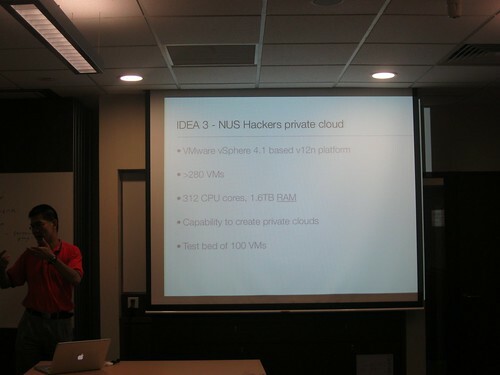 Proposal 3: an NUS Hackers private cloud. We’re putting that on hold while we work on organizational kinks, but it’s good to know that the option exists for the club to tap. 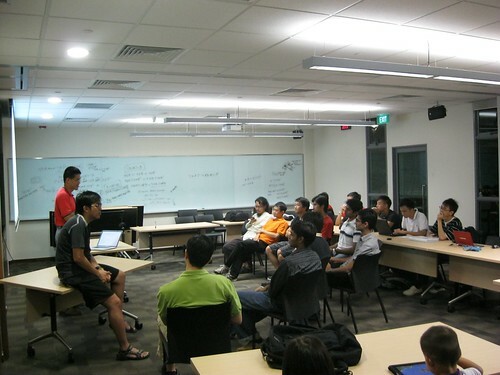 Special thanks to Ong Guan Sin and Yung Shing Gene, both from NUS Computer Center, for coming down and spending some time with us.